Last of the 2008 wines are in the barrels! Previous presses at home went on for hours and got us all juicy and ‘winey’ from our wooden basket press squirting, buckets dripping and the occasional kid tripping over and wiping hands all over our pants and shirts. As fun as it is to make wine at home, making wine at the ‘real winery’ is refreshing. Step one: forklift one ton fermentation bin into the air; Step two: use siphon and gravity to fill barrels 3/4 full with free run juice; Step three: dump, using forklift, rest of must into the press; Step four: push button to start automatic press. 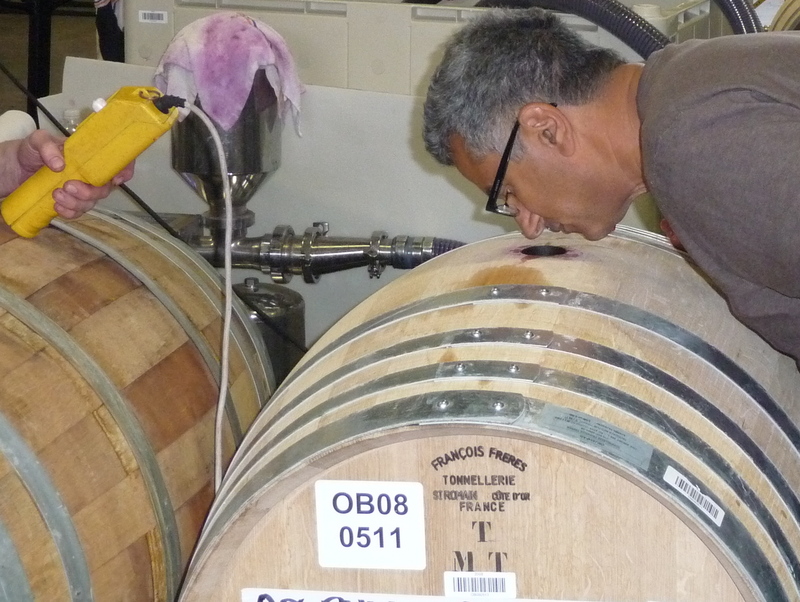 Best part: the smell of a brand new French Oak barrel both before and after filling it…Promises of heaven on earth. Also good: tasting the press wine as it comes raining down from the press. That last part is done in steps as we try to figure out at what point we have enough tannins to go into the already barreled wine. When we reach that point, we stop the press and fill the barrels the rest of the way. Done!